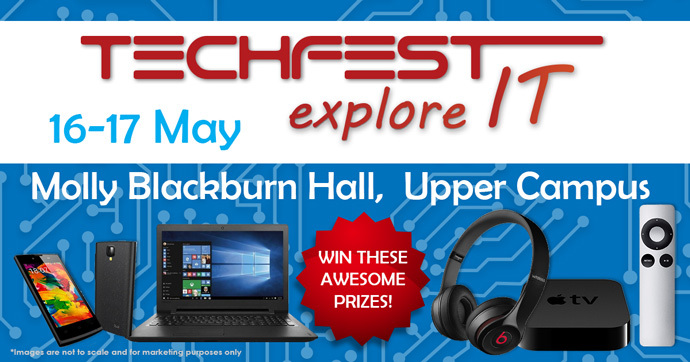 On 16 and 17 May 2017, UCT's preferred IT vendors will be at the ICTS Technology Festival (TechFest), so make sure you pop in at Molly Blackburn Hall on upper campus and check out the coolest gadgets available. The latest desktop computers, laptops, mobile devices, and computer peripherals will be on show. UCT staff and students will have the opportunity to peruse this technology and speak to vendors who will answer your questions and provide advice. You can also enter a lucky draw to win some exciting prizes sponsored by our vendors, including an Apple TV, Beats by Dre headsets, and Digicape vouchers for Apple products. The event is open to UCT staff and students. There's no entry fee, but you will need to register at the door to enter the competition, so please bring your student or staff card. We urge you to attend an exciting line up of info sessions that we'll be running that cover an array of topics from how to get the most of out Lynda.com to Windows 10, Office 365 and different cloud storage options. Did you know, for example, that as a student or staff member you get free access to 10TB of data via Google Drive? To learn more, please attend the info sessions that will run in Hlanganani Junction on the 6th floor of the Oppenheimer Library.